If you're pregnant, you're probably aware of the risk of eating fish high in mercury. Mercury can cause central nervous system disorders, including brain damage and nervous system damage. But mercury isn't the only contaminant that can cause problems to your baby. Polychlorinated biphenyls, parasites and other toxins can also make you or your baby sick. 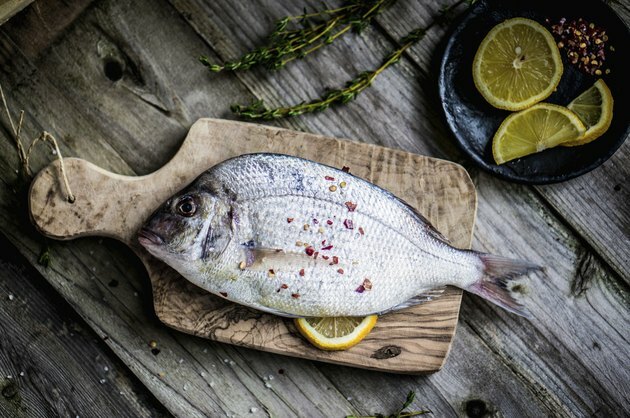 Porgy fish, also known as sea bream, can contain several types of contaminants. Recent studies on mercury contamination in porgy fish is hard to find; most data comes from the 1977, which listed porgy fish as high in toxins. However, the Jersey Coast Anglers Association found low levels of mercury in porgy fish, 0.08 parts per million compared to Mako shark, a fish high in mercury, which contains 2.09 parts per million. The National Smart Seafood Guide 2011 states that red porgy from the South Atlantic coast and the Gulf of Mexico, also known as Tai, is low in mercury and other contaminants. Health Canada lists porgy, spelled "porgie" on their website, as safe for pregnant women to eat in amounts of 2.5 oz. per serving four times a week. Porgy is often used in sushi. Because you don't cook sushi before eating it, you consume any parasites the fish contains. Porgy may contain roundworm larva. To kill the parasites, cook the fish to 140 degrees Fahrenheit or freeze it to 4 degrees F below zero for 24 hours to kill the larva. Roundworm parasites, also called anisakis simplex, cause intestinal symptoms, such as diarrhea, nausea, cramping and intestinal inflammation for several days. If the larva penetrate the intestinal walls, white blood cells around the larva can cause a granuloma, which could be mistaken for a tumor. You can't take most medications used to treat parasites during pregnancy, since they may harm your baby. To be safe, don't eat sushi made from porgy while pregnant. Ciguatera, a toxin that forms in plankton, can accumulate in porgy fish, although to a lesser degree than some other fish. One of the most common causes of fish poisoning, this toxin can affect the fetus during pregnancy. Gastrointestinal symptoms such as vomiting and diarrhea develop within two to 30 hours, with an average of six hours. Nerve symptoms, such as burning sensations, muscle aches and weakness, show up after GI symptoms. In some cases, this infection can be fatal. Fetal symptoms include unusual fetal movements at the time of poisoning. Muscle weakness and facial paralysis have been reported, according to BabyMed. See your doctor immediately if you develop symptoms after eating porgy. Polychlorinated biphenyl, more commonly known as PCBs, can also accumulate in fish. Fish caught near artificial reefs created by deliberately sinking large ships, which can contain contaminants such as PCBs. The Florida Fish and Wildlife Conservation Commission found elevated levels of PCBs in red porgy caught near artificial reefs, according to the Basel Action Network. Low birth weight, small head size, preterm delivery and cognitive delays can occur in children whose mothers were exposed to PCBs before and during pregnancy. Avoid red porgy caught near artificial reefs to ensure your intake of PCBs remains low.